Follow ‘Preparing Active Directory’ on the management machine. 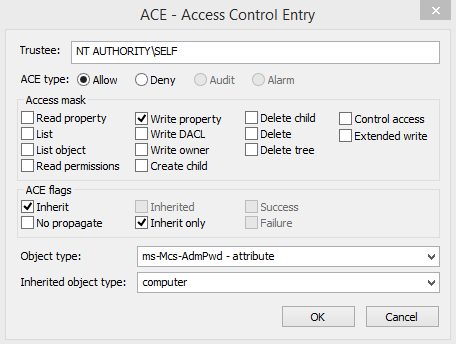 The Active Directory Schema needs to be extended to add two attributes to the computer class. 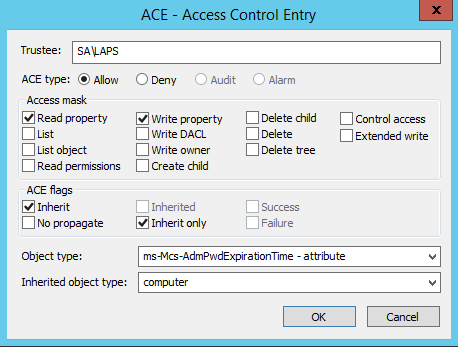 These are ms-MCS-AdmPwd which stores the password in clear text, and ms-Mcs-AdmPwdExpirationTime which stores the password expiration time. You will need to be a member of the Schema Admins security group. 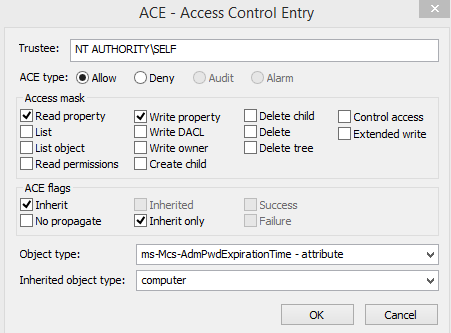 You need to delegate to right to allow the computer object to write to the ms-MCS-AdmPwd and ms-Mcs-AdmPwdExpirationTime attributes. This sets the following permissions against all computer objects within the OU specified, including all child objects. To get information on the groups and users able to read the password (ms-MCS-AdmPwd) for a specific Organizational Unit (OU), run the following. If you need to remove the permission to view the password (ms-MCS-AdmPwd) for a group or user, carry out the following. Here I’m delegating the Security Group ‘LAPS’ the right to view the LAPS Password and to have the ability to reset the password (more on that in part 2). I’ve re-run the ExtendedRights cmdlet, and you can now see that the LAPS group has been added. Set-AdmPwdReadPasswordPermission -OrgUnit "OU=SA Computers,DC=thesysadmins,DC=co,DC=uk " -AllowedPrincipals "LAPS"
Set-AdmPwdResetPasswordPermission -OrgUnit " OU=SA Computers,DC=thesysadmins,DC=co,DC=uk " -AllowedPrincipals "LAPS"
Active Directory is now prepared! 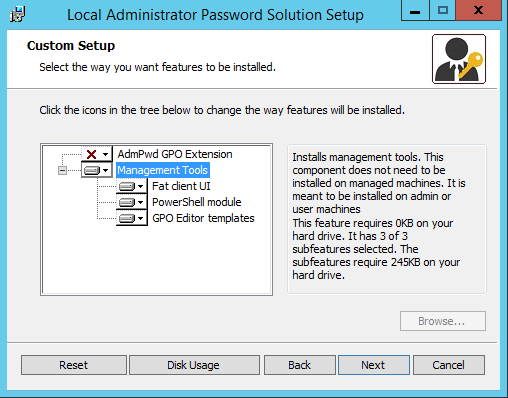 Deploying LAPS is very straight forward, and can be deployed via Group Policy, SCCM, Login Script, manual install etc… By default no management tools are installed, only the CSE required to manage the computer. Deploy the LAPS client to all machines that you wish to manage. 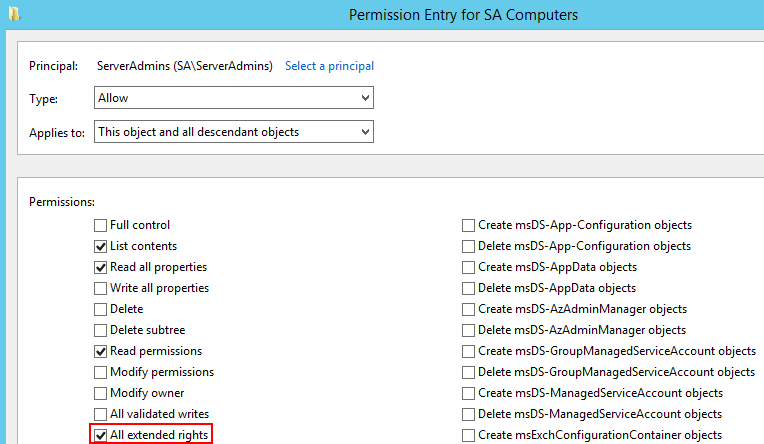 If you want to deploy a new custom Local Administrator Accounts via Group Policy, due to the limitation of software installation you will need to use Orca or InstEd to generate a MST to pass the CUSTOMADMINNAME value. Edit the Property Table, and replace __null__ with the name of the Local Administrator you’d like to create. To confirm the installation has succeeded, confirm that C:\Program Files\LAPS\CSE\AdmPwd.dll is present. The bulk of the deployment has now been completed. In part 2 we will cover Group Policy which will essentially turn LAPS on, how to view passwords and some general discussion on the solution. 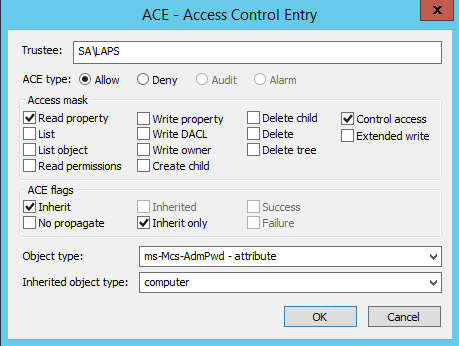 We are looking to implement the LAPS Tool in our Windows Server 2012R2 Active Directory Environment. If the Domain we want to implement this in is not the root domain contoso2.com (contoso.contoso2.com) do we need to extend the schema for both domains or just the one that will have users logging in. I’m thinking only the one contoso2.com will need the schema extension. The schema master is a per-forest operations master role, therefore there is only one schema per forest. With this is mind, you will only need to extend the schema once.